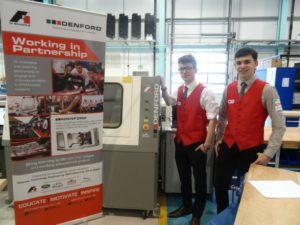 “How we won the UK F1 in Schools National Finals and the Fastest Car Award at the World Finals” was the title of a well-attended presentation by F1 in Schools team, Academy Racing. This team of 17 year old students from WMG Academy, Coventry, were crowned F1 in Schools UK National Champions last year and won a place at the World Finals, which were held in Malaysia. Against fierce international competition, these talented young engineers proved to have the Fastest Car, taking home this award after a week-long trip to Kuala Lumpur. 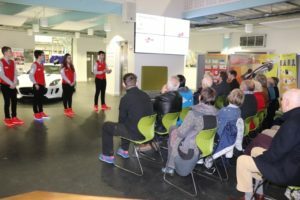 Academy Racing gave a presentation of their journey from initially forming the team, to winning at the National Finals at Silverstone and then on to Malaysia for the World Finals. The three boys and one girl explained all the work they had put in to producing their world-beating car and showcased their achievements to the attendees of this IET regional event with a visual display, as well as unveiling the prize for their success in the F1 in Schools UK National Finals: a new Denford MRC40 Router, worth £10,000 !